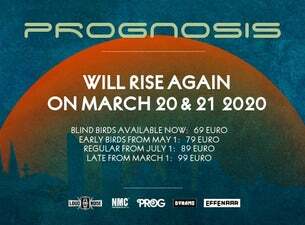 A new 'progressive' multi-day festival appears on the horizon; Prognosis Festival. With bands like TesseracT, Leprous, Witchcraft, Haken, Soen and Sleepmakeswaves Prognosis will be the festival for the real 'progressive' fan. In two full days we bring old and new styles together in a spectacular program. In addition to the music, we will bring the prog-experience to the city of Eindhoven and thus outside the four walls of the venue. On march 22 and 23 Eindhoven will be ‘the place to be’ for every prog fan, musician and professional in Europe.